When I started writing about EVE Online for Massively back in 2008, the MMO genre was really hitting its stride, and emerging sites like Massively were starting to attract quite a bit of traffic. I was a young Computer Science student and massive EVE fanatic with just a few magazine articles and an amateur blog under my belt, equal parts excited to expose my favourite game to a wider audience and apprehensive about screwing it up. 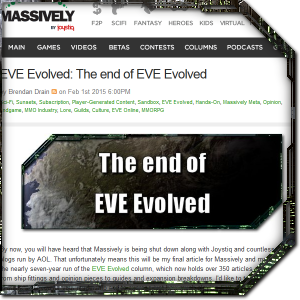 I cautiously penned my first EVE Evolved piece on April 27th 2008, a critical think-piece that set the tone for much of the column’s tenure. Now seven years and over 320 articles later, I’m very glad that EVE Evolved is still here to dish out a regular dose of insight into the often impenetrable world of EVE Online. I think it’s safe to say that this has been one of the most interesting years in the column’s lifetime, especially with Massively shutting down back in February and the staff striking out on our own as independent MMO news site MassivelyOP. It’s been an equally interesting year for the MMO genre, with indications of paid subscriptions dropping across the board and EVE Online showing its first year of non-consecutive growth. As EVE approaches its 12th birthday next week, it’s worth looking back on some of the year’s highlights. 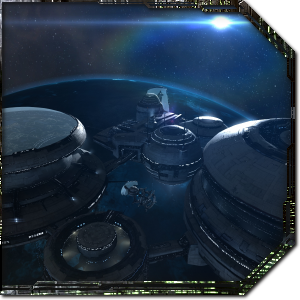 We’ve seen the impact of EVE switching from two major expansions per year to ten smaller releases, a ton of improvements for new players, the exciting resurgence of the 2009 Sleeper storyline, and there’s the promise of a complete nullsec overhaul just around the corner. In this anniversary edition of EVE Evolved, I look back at the past year of the EVE Evolved column and highlights from EVE‘s 12th year! Just a few months ago, we got the news that Massively was closing down with virtually no notice. For a time it seemed that many of the staff’s journalistic journeys were coming to an abrupt and unjust end. A few of the team were snapped up for other jobs, but most of us decided to pull together and launch our own independent site. Thanks to the generous contributions of readers to our Kickstarter campaign (and Bree putting in an insane amount of work), Massively Overpowered was born and columns like this one have been thankfully able to continue with the minimum of interruption. The closure came at something of a bad time for EVE coverage, with the budget to cover EVE Fanfest 2015 suddenly pulled from under our feet. CCP surprisingly offered to pay for my flights and accommodation for the event even before the new site was announced, and I was told that CCP really values my opinions and wanted me there even if I produced no coverage of the event at all. In the end, MassivelyOP was up and running in time for Fanfest and we formalised a new ethics policy that allows us to accept flights and accomodation to approved events as long as we fully disclose all of it in the event coverage. As a result, we got some great coverage of Fanfest 2015! We managed to find out that Project Legion may be stuck in development limbo while developers iterate on DUST 514 and saw an interesting shift in CCP’s priorities toward VR, with an impressive EVE: Valkyrie demo on the Crescent Bay Oculus Rift and four new experimental VR tech demos. We also heard about the impressive plans to add fully customisable structures and player-built stargates to EVE Online in the near future as part of the ongoing work to revitalise territorial control and warfare. I was very critical of CCP’s sovereignty revamp plans in an article before Fanfest, but seeing the structure overhaul rolled into it certainly made me revaluate that position. This year has been something of an experiment for EVE Online, as it switched from a strict schedule of two major expansions per year to deploying around 10 smaller releases in the same timeframe. I was initially skeptical of the change, arguing that expansion names were extremely important for co-ordinating media coverage and getting players hyped to resubscribe for a dose of something fresh every six months. While there’s some debate to be had over the effect this has had on player activity or subscriptions, there’s no doubt that this new schedule has been a huge success for EVE‘s gameplay. Features now come out fully working and polished, and fixes have been applied in a timely manner rather than being delayed for up to six months. There was initially worry that this schedule would lead to only smaller features being worked on, but several massive updates have blown that idea out of the water. We got a complete revamp of the industrial gameplay and user interface with the Kronos and Crius releases, and Oceanus added everything from new PvE missions and a handy notification system to a complete rebalancing of all modules to remove unnecessary module tiers. The massive Rhea update in December added the first tech 3 destroyer, 100 new wormhole star systems, and a unique wormhole hub system called Thera designed to be the Mos Eisley of EVE. At EVE Fanfest 2015, Executive Producer Andie Nordgren showed that more features, bugfixes and content were released in this past year than in any previous year. It’s kind of odd to be praising EVE for its success with this year’s releases while at the same time looking at its slightly disappointing player activity graphs. Although CCP was touting year-on-year subscriber growth as late as February 2014, it had already become clear by then that EVE‘s player activity had plateaued for the past few years. This slipped into a definite downward trend later in the year, and I investigated the problem in October 2014, initially placing much of the blame on factors like the political stagnation in EVE‘s lawless nullsec regions and the decreased time today’s older gamers have to play. More recently, player extrapolations have showed that EVE‘s subscriptions may have dropped by around 18% in the past two years, indicating that the downward trend is not limited only to player activity but also to purchasing decisions. In trying to assess the validity of the 18% drop figure, I found that the entire paid subscription model for MMOs may actually be on the decline and EVE could simply shrinking with the market. This would mean EVE actually bucked a significant downward market trend in 2013 and 2014, perhaps due to PLEX and the very positive reception of updates over that period. While there are no plans for EVE to switch out of the subscription model, CCP has been recently spreading out into alternate revenue streams like selling ship skins and focusing on new games like EVE: Valkyrie. A number of this year’s updates have made EVE far more accessible for new players. Corporations have been given the ability to switch off intra-corp PvP, a mechanism normally used by infiltrators to gank unsuspecting players. With the fear of infiltration removed, many corps are now hiring newbies again! The skill queue has been changed to infinite length to help newcomers train new skills without logging in every single day. Cloning costs and skill point penalties on death were also completely removed from the game, making cheap disposable ships highly cost-effective in all forms of PvP. 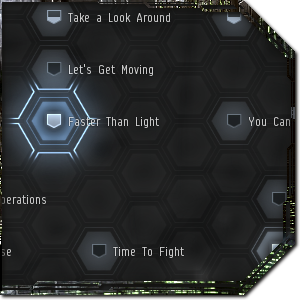 A new Opportunities system recently replaced EVE‘s standard tutorial with an interesting achievement-like approach that has proven much more effective at getting new players into the game. The coming months will see a complete revamp of the corporation mechanics to make corps easier for new players to form, and this summer’s sovereignty overhaul should help open up territorial warfare and nullsec PvP to much smaller organisations. This year I also looked at how various quality of life improvements had improved wormhole expeditions, and started a discussion on four things EVE does right that other sandbox games should take note of. Though it’s easy to think of the year’s updates as simply a series of patches, content releases and mechanical changes, this was the first year when I felt EVE‘s own core storyline truly came alive. 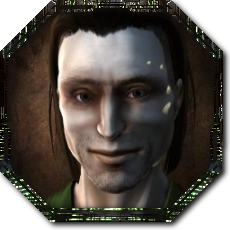 Previous years have shocked and amazed us with the occasional tale of thousands of players clashing over some remote star system or a ferengi-like player swindling other players out of hundreds of billions of ISK, but this year’s NPC Sleeper storyline held me spellbound in a way that none of those could. Things kicked off when a mysterious star appeared in the night sky, and players noticed that it got brighter the closer they got to Jove space. The star turned out to be a massive supernova in the heart of Jove space, which knocked almost all the stargates in the region offline and opened tears into previously unseen wormhole systems. Not long after, Sleeper ships began flying around empire space and scanning everything in sight. They found and decloaked mysterious structures spread throughout the galaxy, which turned out to be long-lost Jove observatories put in place to keep an eye on us. The story took a very sinister turn when the Sleepers began dismantling the Jove observatories and harvesting our corpses for spare parts. It emerged that the Sleepers had found a way to rebuild their bodies, and they’re now planning an invasion of our space. What really struck me about these stories is that they didn’t just happen in news articles and blog posts. They actually happened in-game and consequently spread like wildfire through social networks, in-game communities, and chat channels. CCP even reported on each new development with a short in-character news clip from in-game news channel The Scope. All of this brought me back to when I first started playing EVE and spent weeks reading the game’s official scientific articles and fictional chronicles. The advancing of the 2009 Sleeper storyline both in fiction and actual in-game mechanics made me feel as if I was living through one of those chronicles, and that’s a powerful notion. 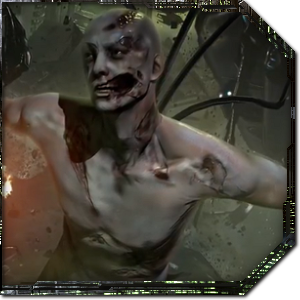 It’s been a year filled with contradictions for both EVE Online and the EVE Evolved column. The column almost came to an abrupt end with the closure of Massively, only to be resurrected through the generosity of our readers. EVE itself seems to be shrinking in subscribers despite developers having done a fantastic job improving and overhauling the game. CCP even released more and bigger features under the its new frequent update paradigm than it had for years in its major expansions. And while the player stories that typically dominated the media slowed down this year, I’ll always remember this as the year that the NPC storylines really kicked off again. As EVE heads into its 13th year of operation, there’s a lot to be hopeful about. The game is becoming more approachable and accessible to new players with each new update, and we have game-changing sovereignty and structure overhauls on the horizon to help give people a place in the world and a sense of ownership of it. We’re sure to get new PvE content too as the Sleeper story progresses, and if we’re lucky we may even get some entirely new forms of PvE gameplay to chew on. While subscription numbers could be on a decline and CCP is certainly seeking alternate revenue streams, it’s clear that EVE Online is still the company’s number one focus. The coming year will certainly be an interesting one for EVE and CCP, and I’m glad to be here to write about it at MassivelyOP. Nyphur You are absolutely right that F2P delays the initial value judgment of the game and therefore brings a people into the game that otherwise wouldn’t give EVE a chance. I like the pilot license idea asci think it would showcase the game. I agree walking stations would help market this pilot license initiative. I would also add shuttles from select stations so that there can be extensive gameplay without a pilot license. Craywulf Arktouros I don’t think the actual price is an issue, subscription MMOs are pretty damn good value propositions at their current price points, the problem is that the market is flooded with free-to-play games that are becoming real alternatives. Free isn’t just another price point, it’s something that bypasses value judgement altogether and short-circuits our decision-making processes. As far as I’m concerned, the best solution would be to provide a limited introductory portion of EVE for free as a kind of never-ending trial. For example, free players could be limited to a small subset of skills and able to fly only tech 1 frigates, and then to fly anything else bigger or access the restricted skills would require a valid Pilot’s license on the account. Next we can let players turn a 30-day PLEX into 30 single-day pilot’s licenses or four 7-day licenses so that people can jump in for short periods of time. The end result would be that players who aren’t subbed could still log in and participate in the community, and the more they interact with the community the more emergent opportunities will pop up that require a pilot’s license. This would lower the barrier to entry, allow newbies to get to grips with the game at their own pace, and let players easily jump back into the game via PLEX with the minimum of committment (1 day for a few tens of millions of ISK). 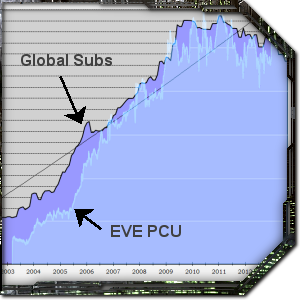 As an added bonus for CCP, the concurrent player activity would be obfuscated as a metric. The potential for abuse that can come from a freemium system like this can’t be any worse than the potential for trial abuse right now. Craywulf I’m sure they’ve offered lots of solutions but the problem is any kind of multi-user environment is simply complex and any kind of change can be like dropping a rock in a pond. And with a game that’s been out and established as long as EVE that pond is pretty still (to continue the analogy) so anything will cause huge disruption at this point. My first idea would be a lower pay tier with heavy restrictions, like an unlimited version of the current trial and it’s restrictions. However that has huge consequences in terms of economy because now there’s a lot more players out there all generating resources. They generate ISK (missions) as well as potentially flood the market with goods (unlimited miner alt accounts). This kind of economy disruption has a huge impact on the game to mention nothing of even crazier ideas like 100 people each with 10 accounts all in a system on noobs multi-boxing a “1000 man” battle. So I thought about it for a bit and only thing I think will really work is if they setup a second, smaller universe/server for an alternative pay model. Invest some hardware resources (this is the big ask), setup a universe that’s only 200-300 systems (EVE normal is 2500 or so). This would reflect normal EVE universe (same ratio of 0.0 to 1.0 with a single faction safe area) and allow them to try an alternative pay model. If I’m not mistaken they have limitations on dual clienting with trials, implement that and give it a shot. The worst downside it would have is people from normal EVE universe would also play there. If it works out wildly successful they could always introduce an event an event to explore and find a Wormhole route to the new system and establish jump gates and merge everything into one server and transition everything over to F2P. People might be pissed and quit, but at that point you know you have a working financial model which will bring new people in. Arktouros I think the player-base seems to think they can dictate the terms because CCP has allowed their input. I am curious if the players have provided CCP any alternative solutions to fix the declining subscriptions? One thing everyone knows in the MMO business is retention is always an uphill battle. You never stop bleeding customers. Companies have to constantly figure out new ways to bring in new customers because the ones they lose are harder to bring back. So that being said, I don’t think one patch or expansion broke EVE’s retention, so I don’t think reverting anything is going fix the problem. CCP simply has to find new customers. I doubt the player-base has a clue how to do that, let alone willing to provide an adequate solution. I really believe that new customers would flock to EVE if subscriptions were at least $5 a month. I jump in and out of EVE often, but always read the weekly column. Found tons of them helpful and had me thinking of what to do when I resubscribe even. Craywulf It’s honestly a damned if you do, damned if you don’t scenario. Anytime they even think about changing things up the game veterans freak and threaten to quit on them like you saw with Monoclegate. If they introduced things like alternative pay models they get upset, throw a fit, and threaten to cancel their only source of income. I mean even if they setup an entirely separate universe of players on that alternative model it would spark outrage. Meanwhile it’s a gamble if new players would stick and spend money on EVE as a product. So you potentially alienate your player base for potentially low benefit…risky for em. Denice J Cook They are doing this for quite some time now. Happy seven years and I hope for many more! I wonder if lowering the subscription fee would decrease the barrier for new players. It would probably dramatically decrease the value of PLEX, but if the decline continues, they are gonna need to make some changes in their payment plan. 12 years is very respectable for this game and I think there’s a lot of life to it.